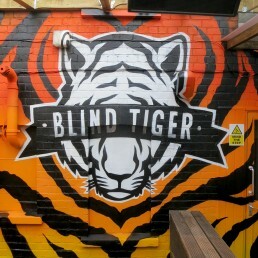 We were asked to design and paint a mural to transform the courtyard garden area of Newport's Blind Tiger nightclub. 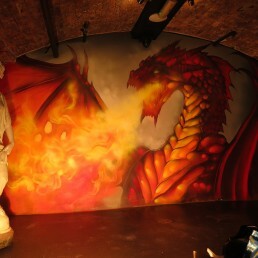 We were asked by Cardiff's Lady Bird nightclub to create a contemporary and stylish graffiti /aerosol art mural to celebrate the Rugby World cup which was held in Cardiff. We were given free reign to create a feature wall for a communal area of a business centre based in Cardiff...this is what we done! 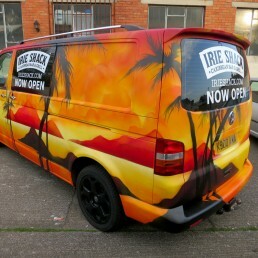 We were asked by Irie Shack restaurant in Cardiff to re-spray their vw transporter to fit in with their Caribbean branding and to act as the perfect mobile graffiti art mural advert for their new restaurant...This is guaranteed to turn heads! 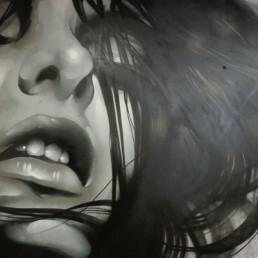 Graffiti art shop shutter mural commission for trainer store SIZE? 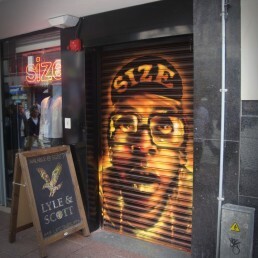 Store/shop roller shutter murals are a great way to advertise your business during closing times.